Since before medieval times, beer has been one of the go-to drinks to quench your thirst. Better known as ale, the alcoholic beverage was consumed by all social classes and was an alternative to drinking wine, which could be difficult to obtain in some regions of Europe due to harsh grape-growing conditions. As a result, beer was one of the most commonly drunk beverages, and the trend continues to this day. While the recipes have been refined a lot since medieval times- making the experience of drinking beer a lot more pleasurable- it is especially in recent years that beer has undergone a bit of a makeover, with many independent craft breweries popping up. Also redefined are the stereotypical beer drinkers- manly blokes watching the footy in their singlets and stubby shorts. Instead, a new breed of beer drinker has emerged- made up of trendsetters and hipsters- who aren’t afraid to try new and unique flavours. As such, brewing artisans have emerged from the woodwork, having taken on the challenge to tweak their recipes and cater to this new market. Adding everything to their brews from cherry pies to bulls' testicles, these people are pushing the boundaries to create unusual new flavours- many of which you wouldn’t expect to find in your average brew. But how is one to find these exclusive beverages? 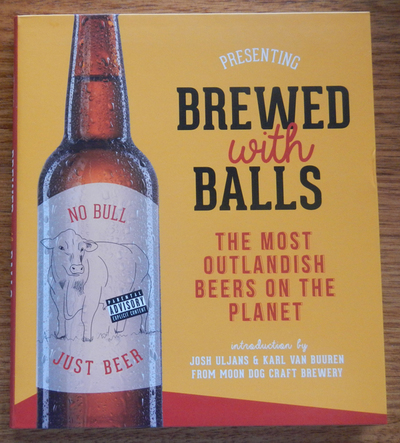 Well, that’s where this book, Brewed with Balls, comes in handy. Featuring 65 of some of the more unique beers on offer around the world, this book provides beer-lovers with all the information they need to track down these elusive brews. While you might need to have a strong stomach, an adventurous palate or a deep wallet for some of the concoctions listed, there are others that are actually available to the general public at a relatively reasonable price. I was able to find four of the listed beers at my local Dan Murphy’s bottle-shop- quite an exciting discovery! These beers were obviously some of the tamer ones listed in the book, but being able to actually locate them in a store made the experience of reading the book feel more real. Perhaps this was because it proved that the beers actually exist! Among the beers I (gladly) couldn’t find were ones that feature animal droppings, goat’s brains, kelp, beard hair, pizza, squid ink and even blue cheese. I’ve already mentioned the beers that feature cherry pies and bulls' testicles, and there are plenty more unusual recipes listed. Also getting a mention in this book is a beer that is drunk poured from a small animal carcass- of which only twelve bottles were made. This book provides an extraordinary, somewhat innovative, collection of beers that only a true connoisseur would be tempted to try, and would make an interesting addition to the library of any beer-lover.